Winnie the Pooh and Tigger, too! Beast Kingdom is proud to present one of the most iconic and adorable scene from Winne the Pooh! Pooh Bear and his rumbly tumbly pay a visit to his friend Rabbit for a bit of honey. Full and content, Pooh gets ready to leave but finds out his tummy doesn't fit through Rabbit's door! This 6-inch diorama perfectly captures that funny scene inside and outside of Rabbit's home. Using 3-D mold sculpting technologies coupled with multi-layred paintwork, each character is faithfully replicated and set on a themed base. 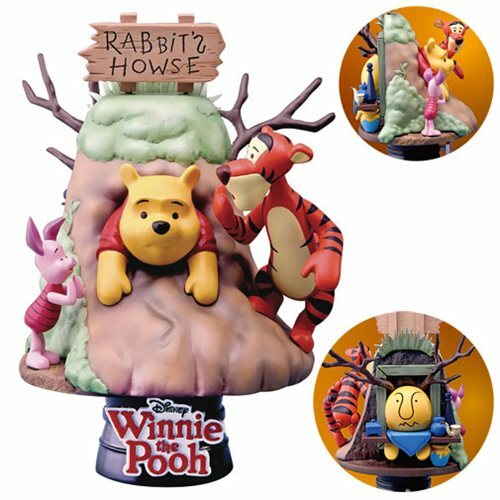 This Winnie the Pooh D-Select Series DS-006 6-Inch Statue - Previews Exclusive is the perfect addition to your collection!